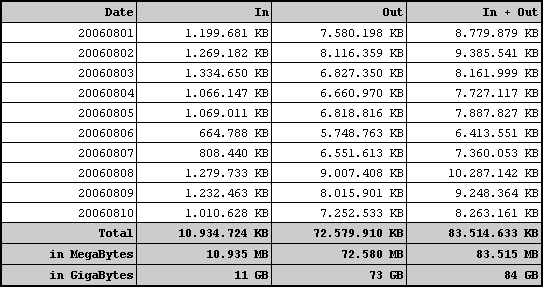 IISlog traffic parser 1.0 is a small and fast utility for extracting and adding up the amount of incoming and outgoing data traffic on a web site based on webserver logfiles. It finds the log fields "cs-bytes" and "sc-bytes" in each line in all logfiles in a specified log folder and generates a report file. 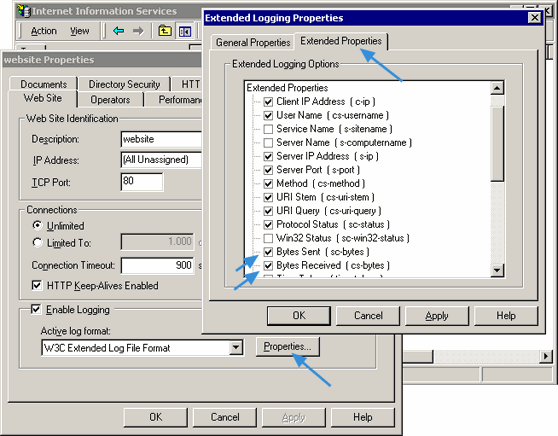 Note that the "cs-bytes" and "sc-bytes" fields are not selected by default in IIS, so you have to enable them in the IIS Manager before they show up in the log files (see screenshot below). The parser is hand-written in C#. On a 2100MHz CPU, it processes logfiles at 32 MB/sec. Disclaimer: The program is provided 'as is' without warranty of any kind. I have done my best to incorporate graceful exception handling and to test the code in different scenarios, so it shouldn't be able to do anything bad. To use the program, download the zip file and extract the .exe file to a folder of your choice. The program is a simple command line utility that takes two parameters: A log folder and a report output file. See the command line screenshots below.